“The future of Europe depends on a fair situation for all weak people”. Dinner with a group of Syrians, Lebanese, and Iraqis in a converted sports hall in Weissach, in southwest Germany. Photo by author. All rights reserved. Comparing the refugee situation in Germany with the refugee situation in the UK is like comparing a dinosaur with a gecko. Since leaving London at the beginning of May, we've cycled about a thousand kilometres through England, France and Belgium, talking to residents and refugees about how their lives have been changed by migration. It felt like France and Belgium (the less said about the UK the better) are socially and politically unable or unwilling to accept refugees wholeheartedly, but are trapped by international conventions into providing shelter and survival. 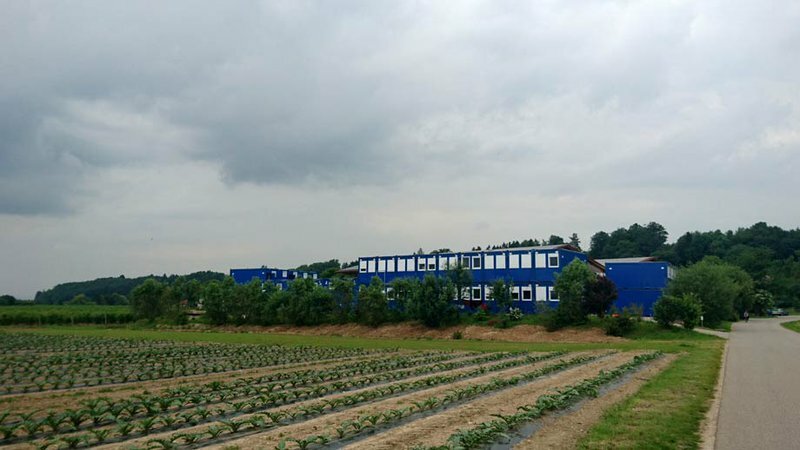 The result is an embarrassment for everyone: refugees packed away into buildings, containers or tents on the outskirts of towns and villages, with some eking out an uncertain existence in the asylum system for a decade or longer. But now that we’re in Germany, there’s a different problem. Refugees have been welcomed, at least politically, and at least in theory. Comparing the refugee situation in Germany with the refugee situation in the UK is like comparing a dinosaur with a gecko: yes, they are both reptiles, but that’s missing the point. The UK has “pledged” to accept 20,000 Syrian refugees over the next five years, in addition to the barely 5,000 already there. Since the start of the Syrian Civil War in 2011, Germany has welcomed around 600,000. And that's just Syrians. If the so-called ‘refugee crisis’ in the UK, France and Belgium is best described as a collective failure of moral courage, then, no question, Germany has a very different refugee crisis. The crisis here is one of integration. Heidelberg feels less a town and more a university campus. Arriving from the industrial north, we’re suddenly in the land of bicycles, scrubbed smiles and yoga mats. Heidelberg has a population of 150,000, a third of which are students. In the summer, they’re replaced person-for-person with tourists, gaggling in the cobbled streets, selfie-ing under the castle, and monkeying around with the Heidelberg baboon. A container park in Garching an der Alz in southeast Germany. Photo by author, all rights reserved. Outside the town, lodged in a former American army base, is a holding camp for refugees arriving in the south west of Germany. We’re not allowed inside, but refugees come and go, with free buses shuttling into Heidelberg. A dual carriageway separates the refugees from the town, and only one bridge leads in and out. Leaning on the bridge parapet is Saif, a man from the Western Sahara in his late twenties. He's an optimist and talks easily about his plans for the future, how he will learn German and make German friends to help him through the shock he's felt in this alien culture. “I thought in Germany everything would be easy”, he says with a gappy smile, shaking his head in bemusement. “In Germany they do everything different. They look different, they talk different, they do different”. He smiles again: “even the weather different”! But, as he talks, it becomes clear that Saif's future is nowhere near as secure as his optimistic demeanour suggests: he's been here for two months already, and only has one month remaining on his temporary documents. He's far from halfway across the bridge dividing refugees from residents. Inside the Heidelberg railway station café, we meet Regine, who works for an evangelist church in their refugee and integration programme. Regine began her career working with refugees in the 1980s, and reminds us that Germany has welcomed migrants on a similar scale several times in the past, most notably after the fall of the Soviet Union and during the conflicts in the Balkans. Despite the former German chancellor Helmut Kohl’s long insistence that Germany “is not an immigration country” (Deutschland ist kein Einwanderungsland), Regine says that in fact “Germany is an immigrant nation” and that – remarkably – this is enshrined in law. Regine’s church alone is dedicating over €10 million over the next three years to their refugee integration programme. Germany is the second most popular migration destination in the world. I hadn't realised that 12 million refugees displaced after the Second World War were forced to move into the new Germany, nor that invitations to immigrate were extended to Russian Jewish communities, to the million or so Kazakh Germans, and to millions more Gastarbeiter (guest workers) from Turkey and elsewhere. Germany acknowledges the indelible debt she owes her immigrants, who rebuilt the country from the ground up and helped fuel the ‘economic miracle’ of the post-war and cold war years. Part of Regine’s job is to support the thousands of volunteers who have taken an active role in welcoming the latest wave of refugees by becoming mentors and friends to the newcomers. It’s not just German volunteers either: in Mannheim there are over a hundred clubs and associations for all nationalities – Iraqi, Turkish, Macedonian, Eritrean, Italian. What’s interesting is that so much of the support work for new immigrants is done by such volunteer groups: Regine’s church alone is dedicating over €10 million over the next three years to their refugee integration programme. 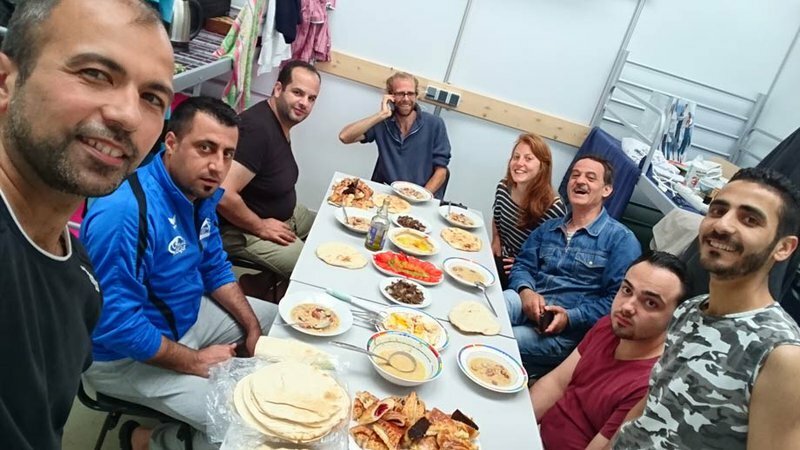 In other towns we visit, such as the Bavarian spa town Bad Tölz, we see how a single volunteer refugee organisation can mean the difference between newcomers ending up among the state-supported unemployed or as working taxpayers. This means that, for refugees, who are randomly sent to this or that town, their new life becomes a lottery. In Bad Tölz, we enjoyed a pot of tea with Muafeq, a Syrian family man fortunate enough to find an 'ein Euro' (one euro) apprenticeship at AsylPlus, a small organisation set up to deliver online German language instruction to refugees. As the organisation expanded, Muafeq was able to transition from his ein Euro wage to being a fully paid member of staff. These young people want to work, and their work will pay for our pensions. 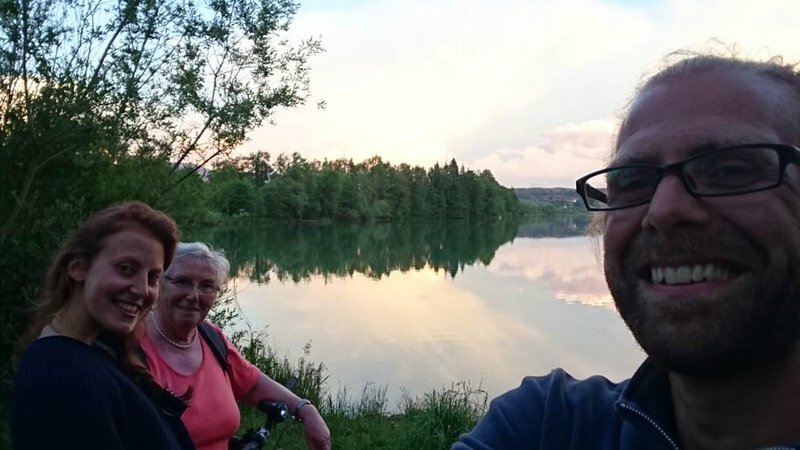 The founder of AsylPlus, an indomitable Bavarian grandma called Frau Haase, is passionate about the need for refugee integration and evangelistic about the power of computers to do the work of a hundred thousand teachers. But mostly she is frustrated with her countrymen who don’t see the benefits brought by the new arrivals. Yes, the state supports refugees financially, but where does that money end up? “Check your pockets”, Frau Haase says. “Refugees spend their money, in shops, on accommodation – not like rich Germans who keep their money in the bank”. Frau Haase sees the state support for refugees as a form of financial redistribution, benefiting everyone in ways that are perhaps hard to see, but are there nonetheless. “Germany is old”, she adds, “these young people want to work, and their work will pay for our pensions”. She smiles mischievously: “not for me, of course, but for many people refugees are big business”. With Frau Haase (back left). Photo by author, all rights reserved. The big business of integration, however, has largely been left to private individuals and organisations like Regine's church and AsylPlus. Despite their fine words, the German state has taken a back seat role, reluctant to commit too far in one direction and risk angering the growing numbers who believe refugee support has gone far enough. Towns like Leipzig and Dresden in the east of Germany have seen constant protests and counter-protests by far right and left groups. Even in the wealthier west of the country, anti-immigration parties like Alternative für Deutschland (AfD) have been winning seats in recent elections. Back in Heidelberg, Regine blames this trend on radical reductions in social services since the 1990s. These reforms, she says, have made life very difficult for the poorest and have frustrated those on middle incomes who see their financial situation moving backwards. Part of Regine's work in the church is to try to make sure that vulnerable Germans don’t feel excluded amid the outpouring of support and concern for refugees. In Mannheim, for example, the church hosts a mixed choir of refugees and the unemployed, where all nationalities sing and perform together. How can the state expect refugees to become independent of them if they don’t have the resources to learn German or find a job? As we prepare to leave, Regine looks up to the television that plays in the café. Angela Merkel is speaking from a lectern, about reforms to the integration law. The law’s aim sounds reasonable enough: to stop unlimited financial support for refugees who fail to find a job or learn German. But Regine is worried that the law will only make things worse. She’s sceptical that the state will support their programme of integration with enough money. How can they expect refugees to become independent of the state, if they don’t have the resources to learn German or find a job? They can’t expect the church and volunteers to pick up the slack forever. Now that refugees have been accepted, the state’s reluctance to commit has only exacerbated the challenges of integration. Without full integration, refugees will find it impossible to contribute effectively in their new society and will become the drain that the far-right accuses them of being. The government's exaggerated effort to avoid angering those who criticise their open door policy to refugees is, tragically, only adding ammunition to arguments against immigration. As she shakes her head, I ask Regine whether she’s still an optimist. She dodges the question: “The future of Europe”, she says instead, “depends on a fair situation for all weak people”. 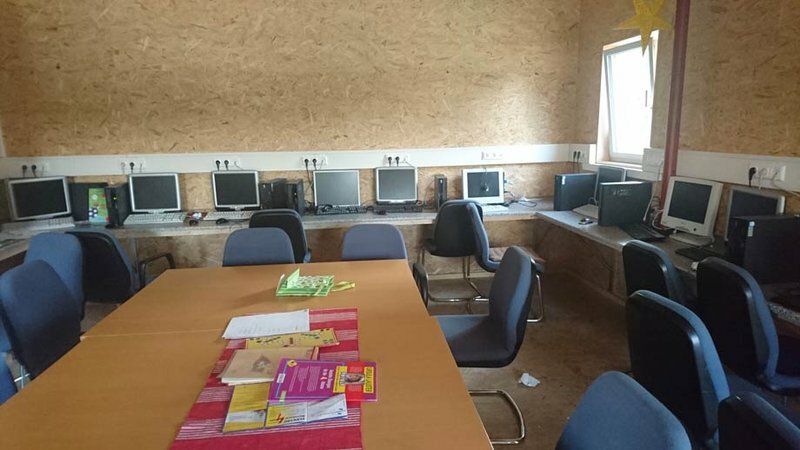 An AsylPlus computer room in a container park in Bad Tölz. Photo by author, all rights reserved. But the lesson from Bad Tölz is that, with application and appropriate support, Europe can make it. Three years after arriving in Germany, Muafeq speaks fluent German and has a full-time job. His kids are settled in school and getting good grades. He and his family live in their own house in Bad Tölz and they no longer receive any social support from the state. He is the proud owner of a German-made family car. He pays taxes. He has integrated. Follow David's journey through his mailing list or on his blog. David is also raising money for The Bike Project in London, which takes second hand bikes, fixes them up, and donates them to refugees. Please consider a donation!